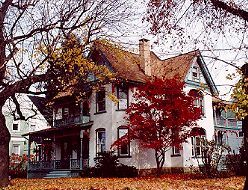 1894 Victorian riverfront home in historic district... where guests enter as strangers and depart as friends. Amenities include: memorable full breakfast; air-conditioned rooms with skylights or private balcony; suite has kitchen, dining & living area; entertainment center with family movies; whirlpool; music room with grand piano; formal dining room and parlor w/fireplace; period furnishings; spinning and weaving studio - demos by request. Two guest rooms with semiprivate bath; one guest room with private bath; suite with private bath. Walking distance to theater, restaurants and parks. Well-supervised children welcome; limited pets; no indoor smoking or alcohol; open all year; reservations preferred; MC/Visa/AE/DISC. Perfect stop on PA I-80 - just 3 miles off Exit 19 in rural West-Central PA.
Rates: Single - $45- $60; Double - $50-$75; Suite $85-$105. 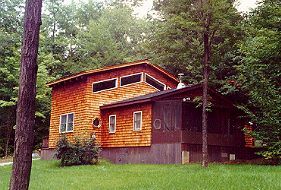 Also available: completely equipped 3 bedroom cabin nestled on 8 forested acres. 2 miles to Parker Dam and Elliot State Parks with swimming, boating, fishing, trails and many outdoor activities. 2 night minimum for cabin. Exit 18 PA I-80. Rates - $60-$100. This and other Clearfield Bed and Breakfast Inns can be found here in The Register.